Only 3 out of every 10 leads are ready to convert. So what happens to the other 70 percent? Effective content marketing engages these leads and keeps them moving through the sales process by providing the right information at the right moment to the right stakeholder. That’s all well and good if you know what information the leads need, how to provide it, and who to provide it to. But what if you don’t? This is where most businesses get stuck. Businesses know they need to publish blogs and white papers, run email marketing campaigns and share case studies. So they do. They crank out blog posts optimized with keywords and engaging images. They publish infographics and send emails. Maybe a lead downloads a white paper or visits the company blog. The sales team reaches out. Crickets. They reach out again. Still nothing. Then, after months of inaction, the lead selects a different service provider. What went wrong? White papers, eBooks, blogs, emails and case studies can all play a critical role in the moving leads through the sales funnel and ultimately closing the deal. Without an effective strategy around this content, however, it ceases to be impactful. It’s no surprise then that 79% of all marketing leads never convert to sales. Content that’s haphazardly created and distributed without a strategy aligned to the realities of today’s sales funnel won’t generate results. Period. Today’s fragmented digital landscape makes it harder than ever for businesses to connect with the right customer at the right time, much less distribute the right information. Further complicating this is the fact that today’s average sales cycle is now 22 percent longer than it was five years ago with at least three decision makers participating in the buying process. Problem 1: Shifting Market Dynamics. 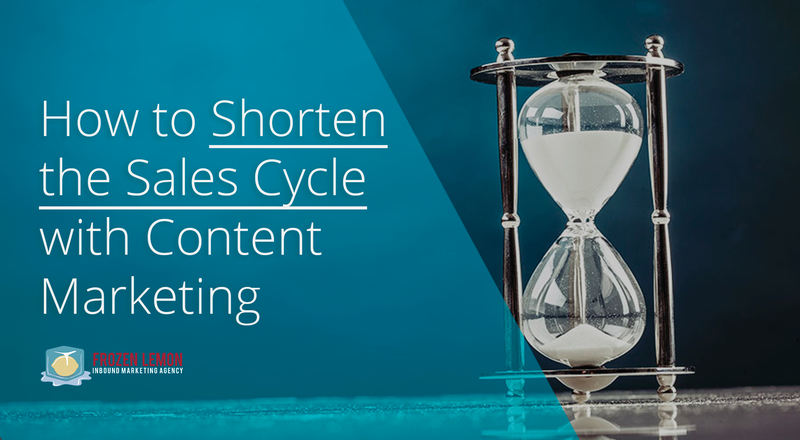 Today’s longer sales cycle reflects shifting marketing dynamics. Shorter attention spans, increased competition, smaller wallet size and new digital marketing channels are fundamentally changing how companies market their business. While companies have larger budgets than they did five years ago, they’re still cautious about making major purchasing decisions. Problem 2: More Stakeholders, Less Decision-Making Power. Today’s longer sales cycle means more stakeholders with less decision-making power. Why? Everyone wants to weigh in on a major deal, but few want to be responsible for saying, “Lets invest $1 million in this solution.” Consequently, the decision-making process drags on… and on… and on. Potential solutions are considered and then discarded. Even identifying and engaging with the right decision makers can be a long process. Problem 3: Buyers with decision-making power aren’t talking to sales. Just to really throw a wrench in things, buyers go through about 57% of the purchasing process before ever talking to sales. Today’s buyers are hyper-informed and aware. Once they realize there’s a problem, they’re busy gathering information and evaluating solution providers. Buyers don’t want to listen to your sales pitch until they’re sure you would be an effective solution provider. Content marketing has effectively replaced your sales team. Problem 4: The Majority of Leads Are Not Ready to Convert. These leads may not know enough about your company to determine if you’re an effective solution provider. They may not even realize they have a problem yet, or understand what it takes to solve this problem. In fact, the person you’ve identified as the “lead” may not even be the correct stake holder or decision maker. Problem 5: More Content Doesn’t Equal More Leads. The typical B2B buyer is bombarded by dozens of marketing and sales messages each day. B2B buyers receive at least 20 unsolicited email marketing messages each week. On the B2C side of the world, it’s even more crowded. Social media feeds are packed with companies pushing content about their products and services and our in-boxes are overflowing with unwanted emails. We’re drowning in information overload. Problem 6: Wrong Strategy Means Missed Opportunities. Marketers are faced with a fundamental mismatch: they’ve got great content but the content isn’t reaching the right leads at the right time. Instead, it’s floating in digital cyberspace, cluttering up the wrong in-box while the right in-box sits empty. The result: poor ROI (or no ability to measure ROI at all) and that sinking feeling that you’re just throwing content at the wall in the hope that something sticks. It’s not the content that’s failing; it’s the strategy that’s holding your company back. Aligning your content marketing program with the sales funnel solves these problems. During the first phase of the sales funnel, businesses are just starting to realize that a need or problem exists. In fact, it may only be by reading your white paper that they even realize they have a problem and should take action to find a solution. This early phase of the buying cycle represents a unique window of opportunity for your business to define the buying vision on your terms. The second phase of the sales cycle is a tricky one to manage. Your lead is aware there’s a problem and is considering various solution providers. Sitting back and waiting for your lead to make a decision is the wrong approach– you risk being forgotten and outmaneuvered by the competition. The alternative, calling or emailing on a regular basis, can also work against you by overwhelming your lead with too much information. You risk being over-zealous in your sales pitch. The right content program will keep you top of mind without alienating your lead due to too much contact. The final stage of the sales cycle often takes the longest. First, the good news: you’ve made the cut! Now, the bad news– your lead is taking forever to make a decision. What can you do to move this process favourably in your direction? Case studies anticipate and answer your lead’s concerns and helps drive company consensus around your business as the single solution provider. Content marketing addresses many of our changing marketplace dynamics by defining the buying vision in your favour, engaging leads as they consider different solution providers, and eliminating decision maker friction. But this only works if the right content reaches the right lead at the right time. Ready to get started? We’ve published in-depth guides to help your business align content strategy to the sales cycle.